Growing up, Jennifer Villamin looked for Filipino food wherever she went. Villamin, who was born in the United States and identifies as Filipina-American, moved around a lot as a kid. She wondered how it was possible for her family to always somehow find the Filipino community, but not Filipino food. For many Filipinos, this question stems from many Americans' first exposure to Filipino food. It was at the 1904 World’s Fair in St. Louis, during which fairgoers watched as Filipino villagers were fed dog. 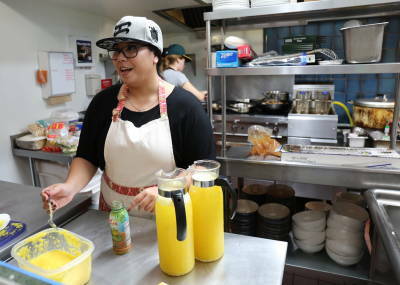 “We’re just showing them that Filipino cuisine is so much more than the stereotype that's been out there for the past few generations,” said Villamin, owner of Pampalasa, a Filipino sit-down restaurant in San Francisco’s South of Market district where Filipinos gathered to host a pop-up dinner Sunday. “We're part of a lost generation," Villamin said. 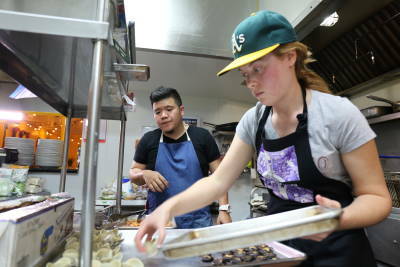 "So many of us now are born here in the United States and almost none of us know the language, so we hold onto our culture through food,” she said. 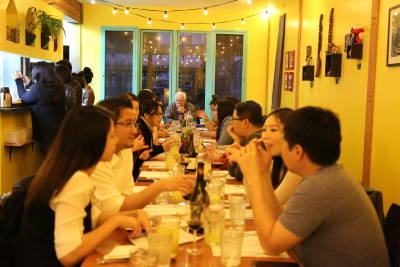 The pop-up dinner was presented by Chicago-based Filipino Kitchen, a traveling organization set on connecting Filipinos everywhere to their culture with food. 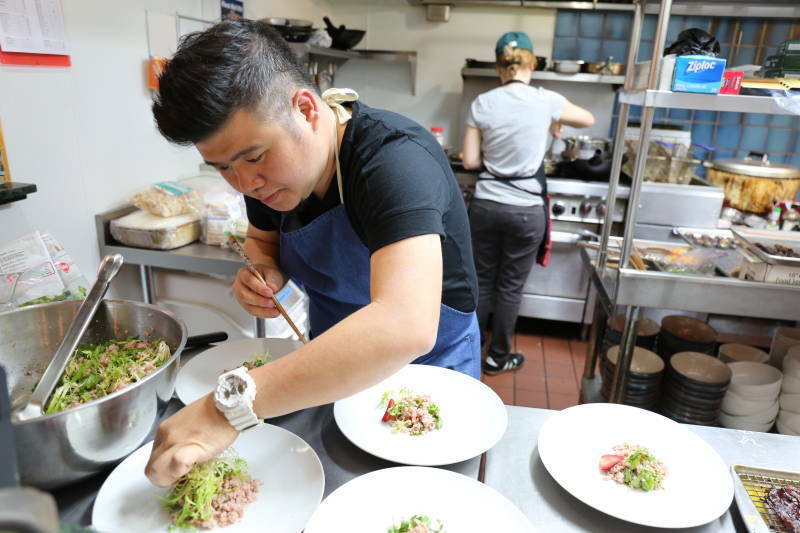 Tee sought to feature his own version of less well-known Filipino foods such as lomi, a Chinese-influenced soup, and pares, a braised beef dish. Tee says pop-up dinners like this one are meant to gather the Filipino-American community while pushing Filipino food into the mainstream. Filipino Kitchen hosts pop-up dinners across the country, taking Filipino cuisine to many Filipino-Americans who Roxas says miss the flavors of home. For her, hosting these pop-ups was a personal journey about reconnecting to something that was lost. Roxas realized that she didn’t want anyone to think it was OK to feel that way. That’s one of the reasons why she co-founded Filipino Kitchen. But sometimes, the food presented can be unrecognizable to some Filipinos. One of Tee’s menu items, “sige lang sige” or “keep on going,” featured shredded chicken adobo tacos with green mango salsa and roasted cherry tomato. Another, a twist on the traditional "silog" meal, featured bacon tocino, arugula, heirloom rice, strawberry dressing and egg. Roxas says this is the kind of creativity that pop-up dinners allow chefs to leverage -- creativity showcasing the complexity of the Filipino and Filipino-American identity. “When people say it’s fusion, I’m like, no, it’s history on a plate,” said Roxas, who pointed to the different cultural influences in Filipino food as a result of colonization. “Pop-ups give you that leeway and that room to be creative when it comes to your food and how we really want to present ourselves as Filipino Americans. It's like the simplicity and the complexity of it is such a fine balance that, to me, is just so beautiful." The money raised from the pop-up dinner will go to a public school library Tee hopes to build in the Philippines. The next pop-up dinner will take place in Chicago this month.